The Sidi Crossfire 2 SR Motocross Boots are the epitome of design, safety, and comfort for every level of rider. 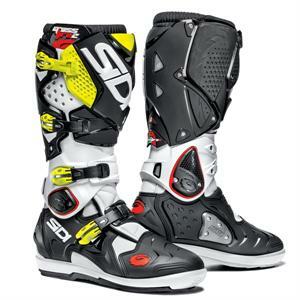 The quality and innovations that make up the Sidi Crossfire 2 SRS Motocross Boots are unmatched. Sidi has taken the Crossfire 2 SRS a step further by incorporating a Dual Hinge System, that allows maximum mobility front to back, but also allows for strict rigidity from side to side. The SRS version of the Crossfire Motocross Boot stands for "Sole Replacement System" which allows a rider to not only replace their soles when they wear out, but can also swap between SuperMoto, MX, and Adventure Touring soles. No re-gluing or sending your MX boots off in the mail, just a simple screw driver and 10 minutes of your time. The Sidi Crossfire 2 SRS Motocross Boots are constructed of Lorica, a synthetic leather that is 1/1000th the thickness of silk, but has a higher abrasion resistance and better breathability over leather. A rider in Crossfire's will notice the weight difference over leather as well as less moisture in the boots, a quicker dry time, and practically no break-in period at all. Proudly built with a "No Bootie" design also adds to the riders comfort, feel on the footpegs, and removes a layer of possible moisture build up which all lead to a better looking, better feeling motocross boot.